The unstable weather in Wageningen drives me crazy sometimes. Davis has unpredictable weather too, but only in few seasons (and not all four of them). I can experience all hot, cold, sunny, cloudy, windy and rainy weather in one day here in Wageningen. Looking at the weather forecast website is an hourly routine, and it is my new best friend. Good thing I have bought new rain jacket so I can bike to the campus without being irritated when it suddenly rain (maybe haha). On a good note, the crazy weather is the only thing that I don't like about Wageningen so far, the rest is awesome! People are friendly - strangers greet me whenever I pass by them, sometimes they even greet me in Bahasa which I find adorable.The nature is so pretty, and this place is calm and peaceful. Fresh produce is a lot, and you can even buy it for cheap. Owh talking about local produce, I was going gaga over the fruits sold at the market. Lots of summer fruits and I can't help buying many varieties. We bought 2 kg of fresh cherries last week, and was planning to make cherry pie but had to change my plan as 'dear' hubby ate 1.8 kg of them (literally!) *speechless* -_-!!! We didn't buy any cherries this week though but I managed to grab few berries for my own use. 2. Beat butter and sugar in a large bowl until fluffy. Add Greek yogurt and vanilla extract and mix until combine. Put flour, baking powder in the mixture and mix, add oil and lemon zest and continue beating for one more minute until everything is combined. Pour the batter in 8' x 8' square pan and bake for 25 minutes or until toothpick inserted into the cake comes out clean. Cool off the cake to room temperature. 3. To make the sauce: Combine everything in a medium pot on a medium to high heat, mash the berries using potato masher and cook until the sauce is thicken (you can add or reduce the water if you want, and you can also add corn flour to thicken up the sauce). 4. 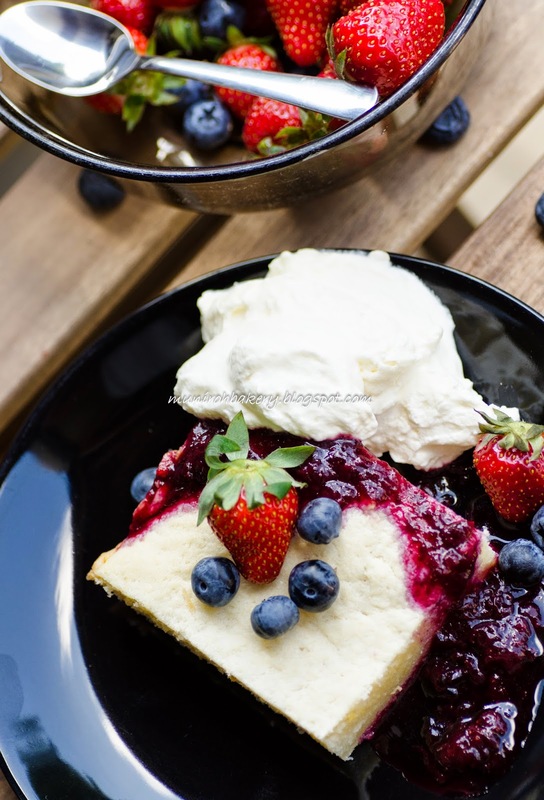 To serve: Cut the cake into square pieces, serves with berry sauce and whipped cream and garnish with fresh berries. This cake is delicious serving warm or cold. p.s: Sugar in Europe is less sweet than the one in Malaysia, so I advice you to reduce the amount of sugar if you follow this recipe and adding more little by little if you want it to be sweeter. 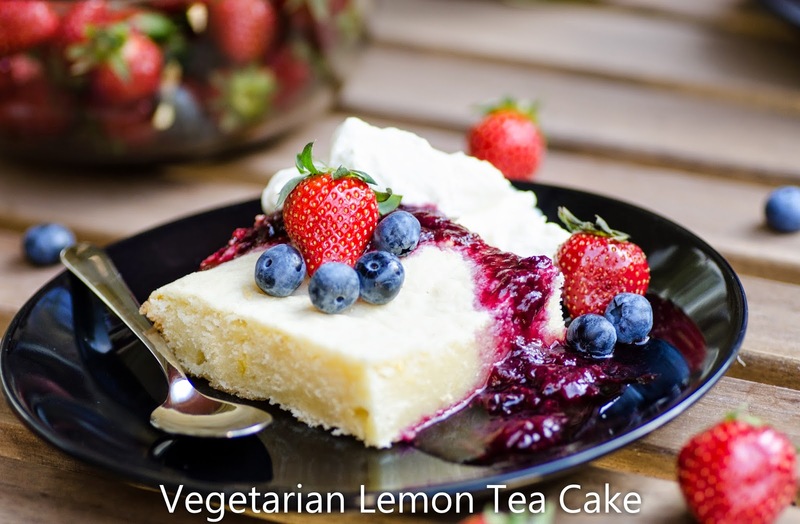 But when I use buttermilk whichbis homemade from full fat milk,still it called vegetarian cake?.. Hi Maria, if you want to make buttermilk it is better you use a full cream milk (a.k.a full fat milk) as you have enough fat for the milk to curdled and becomes buttermilk. Yes it is still consider a vegetarian cake. Vegetarian and vegan are two different things. Vegetarian means you are not consuming any animal meats (eggs included) whereas vegan means you are not taking any animals products (this include butter, milk, buttermilk, cheese, cream, yogurt etc).